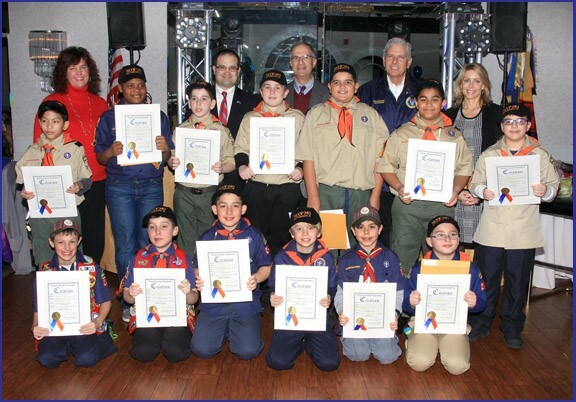 Nassau County Legislator Laura M. Schaefer recently joined with other elected officials to honor thirteen Scouts on being inducted as members of “The Order of the Arrow” and present them with a special Legislative Citation to commemorate their induction. The Order of the Arrow is the national honor society of the Boy Scouts of America. Those elected are acknowledged as having displayed, in the eyes of their fellow Scouts, a spirit of unselfish service and brotherhood. Shown in photo, left to right, along with Order of the Arrow honorees are: Village of Malverne Trustee Patricia Callahan, New York State Assemblyman Ed Ra, Legislator Vincent Muscarella, Town of Hempstead Councilman Bruce Blakeman and Legislator Schaefer.